Social Network sites are one of the innovative technologies contributing libraries the opportunity to reach out to its patrons. Keeping library users up to date is the primary aim of every library, online library services taken the role successfully, and among them Social Network Sites plays the unique role to keep the patrons informative. In this chapter, we provide a study of an attempt to use social media to engage with public libraries. Also this chapter has come out with a testimony on library services and the challenges through FaceBook, Twitter and Weblogs. To study the importance of Social Network sites to reach the library patrons. To identify the possibilities to use Social Network sites for library services. To analyse the challenges and barriers to use Social Networks. 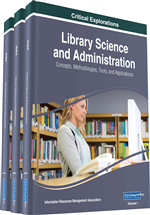 To discuss the way of library services through Facebook, Twitter and Weblogs. To analyse the implementation of social network library services in Indian scenario.